The discovery of an isolated broken carnivore canine lying within a disturbed and tooth-marked rear end of a partially articulated large herbivorous dicynodont skeleton provides a unique taphonomic opportunity to assess the nature of a carnivore-prey interaction in the Late Permian. This analysis also provides data pertaining to the factors that may have influenced the manner in which the animal died, and the subsequent burial of the carcass. The large dicynodont skeleton, SAM-PK-K06446, nicknamed 'Mamafura' (Figure 1a), was recovered from mudrocks of the Tropidostoma Assemblage Zone and had been exposed on a low mesa near the small town of Loxton in the Northern Cape Province, South Africa. Found in March 1984 by John Nyaphuli, the skeleton was excavated in a single plaster jacket, measuring some 2.5 m x 1 m, and transported to the Karoo Palaeontology Laboratory at Iziko South African Museum. Annelise Crean mechanically prepared the specimen with a pneumatic air scribe. It took almost a year to complete the preparation, during which the evidence of carnivore activity was revealed. The skeletal remains comprise a large skull (maxilla-occipital condyle length of 440 mm) with articulated lower jaw and articulated anterior skeleton. The posterior half of the skeleton is disarticulated but still associated, the left femur bears two circular puncture marks and the left tibia shows two scratch marks (Figure 1). Two of the articulated ribs have distinctive oblate callosities indicating that, at some time during the lifespan of the dicynodont, they had been fractured and healed. Embedded within the siltstone matrix, close to the femur, lies a single 35-mm-long, sharply pointed, curved and serrated carnivore canine (Figures 2a and 2b). The root of the canine is not present and the break at the base of the erupted portion of the tooth is clean and sharp. 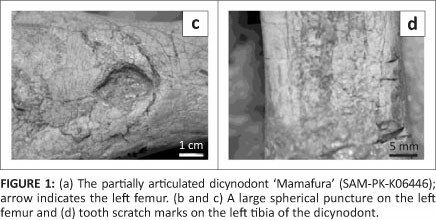 Surface damage on the left femur and left tibia was photographed, and casts of the impressions were taken using dental cement. Some of these casts were coated in gold in an argon gas vacuum for scanning electron microscopy (SEM) (JSM-5200, JEOL, Tokyo, Japan) analysis. 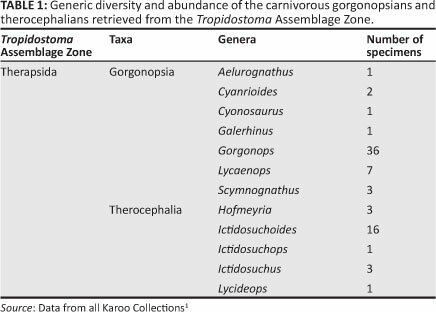 The overall tooth morphology and the width and shape of the serrations on both edges of the shed tooth were analysed and compared with the canines of gorgonopsid and therocephalid taxa that are known from the Tropidostoma Assemblage Zone (Table 1). Dental cement casts of the teeth that most closely matched the size and shape of the unidentified tooth were taken for detailed comparison. 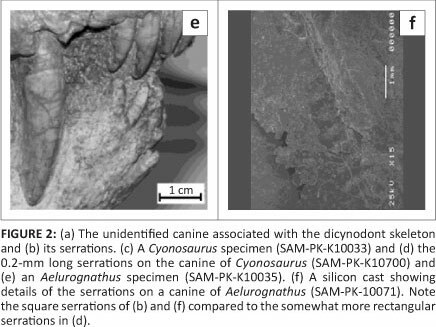 SEM and high-resolution digital images of the serrations of the teeth were used to refine the identification of the source of the broken canine. The contrast between the disarticulated and scattered hind portion of the dicynodont skeleton and the near complete articulation of the anterior half is quite striking. A similar pattern has been observed in another dicynodont, Lystrosaurus murrayi (SAM-PK-K8038) from the Triassic of the Karoo Basin. Behrensmeyer3 defined five stages of bone weathering based on easily observable criteria such as cracking, flaking and skin and ligament presence. These stages can be used as a proxy for the time the bone spent lying on the surface before final burial. Comparisons of the dicynodont bones with Behrensmeyer's bone-weathering stages suggest they only reached weathering stage two. This stage represents about 2 years of exposure on a semi-arid floodplain surface before final burial, corroborating sedimentological evidence that three or four flood events led to the complete burial of the skeleton.4,5 These flood events probably resulted in the transportation of some of the smaller bones, specifically those associated with the toes and feet of the animal, away from the carcass. 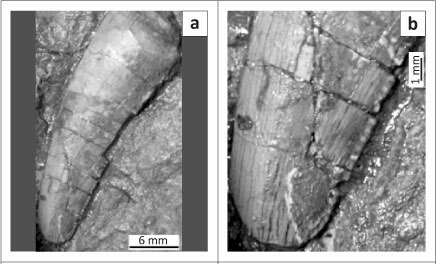 A survey of all exposed surfaces of the large dicynodont bones for signs of bone modification revealed two elongate grooves on the left (disarticulated) tibia (Figure 1d) and a single circular puncture indentation (18 mm in diameter) on the left (disarticulated) femur (Figures 1a, 1b and 1c). The rest of the femur is undamaged. The size of the indentation meant it was not possible to view the impression under the SEM. The portion of the broken carnivore canine is 3.5-cm long (Figures 2a and 2b) and bears distinctive square-shaped serrations, each approximately 0.5 mm in length, along its lateral margins. The sharp and slightly broken base of the tooth is an indication that it snapped off at the base of the erupted part during life. From the faunal list of carnivores known in the Tropidostoma Assemblage Zone, the canine could be from either a therocephalian or a gorgonopsian. However, none of the therocephalian taxa recovered from the same strata have canines with serrations on both margins. Therocephalian canines are generally smaller, straight rather than curved, and more conical in shape. According to Erickson and Olson2 and Farlow et al.6, dental characteristics such as these can be significant in determining the species to which a tooth belongs. The length of the canine and the width at the base and at the tip of the canine, as well as the backward curvature of the tooth, most closely resemble those of the gorgonopsian taxa Cyonosaurus (Figures 2c and 2d) and Aelurognathus (Figures 2e and 2f). The tip of the unidentified tooth appears to have broken off during the predator's lifetime and through subsequent use the top part of the remaining tooth became smooth and rounded (Figure 2b). Similar patterns of 'wear and tear' can be seen in the Cyonosaurus and Aelurognathus specimens in Figures 2c and 2e. 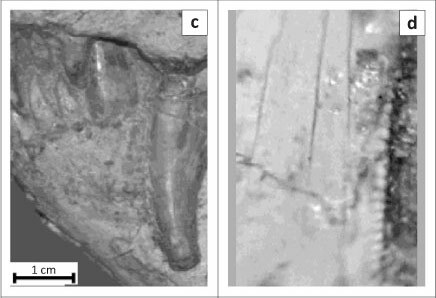 The 0.5-mm square serrations on the unidentified tooth most closely match those of Aelurognathus (Figure 2f) and are different to those of Cyonosaurus, which are rectangular and significantly smaller at 0.16-mm wide and 0.2-mm long (Figure 2d). The scatter of the posterior bones of the dicynodont skeleton suggests that the scavenger(s) started feeding from the rear and the soft underbelly below the ribs. Bone damage (Figure 1) suggests that the scavenger removed some of the left hind limb bones, possibly to gain further access to the softer flesh. This behaviour is commonly observed in modern pack hunting predators such as wild dogs (Lycaon pictus)? It is also likely that, immediately after death, the therapsid carnivore(s), having opened up the carcass, fed from the inside out, and in so doing, did not cause disarticulation of the ribcage and more anterior parts of the carcass. There is no evidence to suggest that any of the bones were deliberately gnawed or cracked. Given the rather delicate incisors and canines, and the few small peg-like post-canines of Aelurognathus (and Cyonosaurus) it is unlikely that they would have been capable of cracking fresh limb bones of the large dicynodont. The sharp, pointed tips of the Cyonosaurus and Aelurognathus teeth (Figures 2c and 2e) suggest they were flesh-eaters as opposed to hyaena-like bone crunchers.8,9 Thus the puncture mark and grooves on the hind limb bones cannot be attributed to Aelurognathus feeding. It is possible that these marks were inflicted by a larger carnivore (perhaps the initial kill predator) that is otherwise not represented in the fossil record, or, although less likely, by some other bone modifying mechanism that mimics tooth punctures. Some animals that foraged on mid-channel sand-bars in the major rivers were drowned during rising floods as the islands were inundated. As these carcasses were transported downstream they slowly disarticulated, dropping bones into the gravel lag that lined scour pools on the channel bed. After being lowered onto the surface of the wet floodplain, the weight of the carcass caused it to 'sink' into the muddy substrate. The subsiding floodwaters deposited silt around the carcass, effectively anchoring it on the floodplain. Once water levels had subsided, one or more gorgonopsians, possibly Aelurognathus, visited the carcass to feed. The disarticulation of the hind part of the dicynodont skeleton is interpreted as an indication that the scavenger(s) concentrated their feeding efforts on the muscles in this region, leaving the head and anterior skeleton relatively intact. A similar pattern of articulated forepart of the skeleton and disarticulated hind parts has been observed in remains of Lystrosaurus murrayi which, despite being from a different time period, nonetheless supports the idea that scavengers concentrated on the hindquarters of the carcass. Our taphonomic study of the dicynodont skeleton SAM-PK-K06446 has provided insight into the ecological dynamics of the Late Permian. The punctures and grooves on disarticulated hind limb bones strongly suggest bite marks made by a large predator which is as yet unidentified. However, we are much more confident in our identification of the broken canine as that of the medium-sized gorgonopsian Aelurognathus, and that it was accidentally lost whilst one or more individuals scavenged the fresh carcass of a large dicynodont on the ancient floodplains of the Karoo Basin, 255 million years ago. The National Research Foundation of South Africa supported this research. We thank John Nyaphuli for finding the dicynodont and his help with the excavation, Annelise Crean for preparing the specimen and finding the shed canine and Sheena Kaal for her help in making comparative specimens available for study. We also thank Derek Ohland for providing access and assistance with the SEM, Romala Govender for assisting in casting the tooth impressions and Ken Angielzyk, Bruce Rubidge and Jennifer Botha for discussions. N.F. conducted the lab work. R.S. provided access to the specimens, made conceptual contributions and assisted in the project design. A.C. was the project leader and A.C. and N.F. were responsible for writing the manuscript.